Scottsdale is a beautiful city that is renowned for its architecture and wonderful resort lifestyles. This new luxury building planned for creation along the Arizona canal certainly fits that mold. 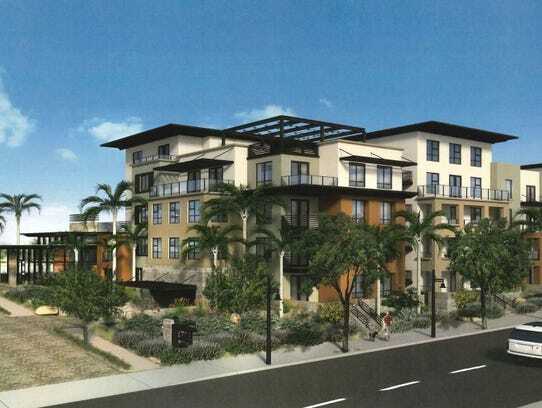 With both hotel and residential condos planned, this is guaranteed to be a desirable location for young and old alike. A $175-million hotel and residential complex called WaterView is the latest big-ticket development unveiled for Scottsdale’s bustling downtown district, situated along the Arizona Canal near Scottsdale and Camelback roads. 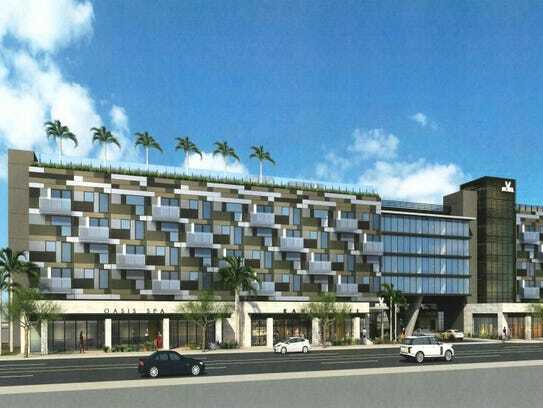 The project includes a five-story luxury hotel with 269 rooms, a rooftop pool and ground-level shops and restaurants along Camelback Road, across from the W Hotel and Scottsdale’s entertainment district. A four-story apartment or condo community would run along the canal to the north behind the hotel, with a pedestrian bridge leading to the numerous shops and restaurants just a five-minute stroll away at Scottsdale Fashion Square mall. Los Angeles-based developers Steven and Shawn Yari, who also built the W Hotel and redeveloped the Galleria Corporate Centre in downtown Scottsdale, filed plans for WaterView to city officials in November. Their company, Stockdale Capital Partners, hopes to start construction in late 2016, Shawn Yari said. But the company must first seek city approval to rezone the 8-acre property, which was previously slated for a similar mixed-use development called Solis. 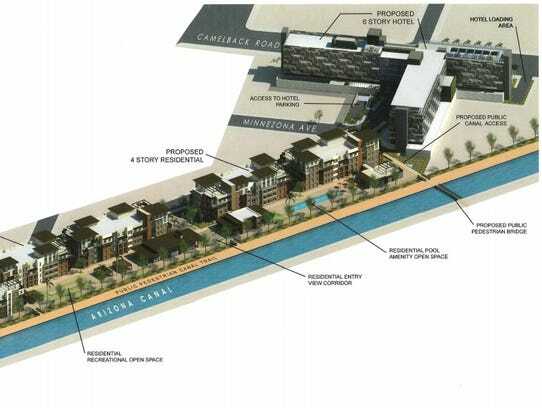 That project had also envisioned a hotel and condos on the land and proposed to move a Salt River Project electrical substation that currently sits next to the canal. Stockdale’s plan, however, wraps around the substation instead, according to city documents. WaterView Scottsdale would include a five-story luxury hotel with a rooftop pool and sundeck and ground floor shops and restaurants near Camelback and Scottsdale roads. WaterView’s hotel will operate under the flag of a hotel chain, but Yari could not say whether it would be one of the major national brands or more of a boutique. It’s planned as a “four-plus star” full-service hotel, Yari said. The rooftop pool deck will also feature outdoor fire pits with views of the McDowell Mountains to the north and downtown Scottsdale to the south and west. The fifth-floor penthouse covers 1,300 square feet — about as big as a small house. The street level includes space for a day spa, event center, lobby, meeting rooms and nearly 11,000 square feet for restaurants and shops. WaterView Scottsdale includes four-story condo or apartment buildings with outdoor amenities like a pool, spa and bocce ball court. The residential side includes about 240 units that could be sold as condos or leased as apartments. The complex features underground parking and a pool, spa, bocce ball court, outdoor yoga space and two-story fitness center along the canal. Residential units range from an average of 511 square feet for the 28 studios to 1,384 square feet for eight three-bedroom units. Stockdale also plans to develop a one-acre park on the northern end of the complex, which would be open to the surrounding neighborhood, Yari said. Twelve years ago, when Yari’s W Hotel was under construction in downtown Scottsdale, the real-estate mogul took a long walk through the neighborhood. What he saw nearly caused him to question his investment. More than a decade later, the area boasts a radically different vibe. The Yaris invested heavily in the city’s entertainment district, east of Scottsdale Road and south of Camelback Road. Many other developers have followed suit, bringing thousands of apartments and condos, a host of new shops and restaurants and multiple expansions to Fashion Square mall.